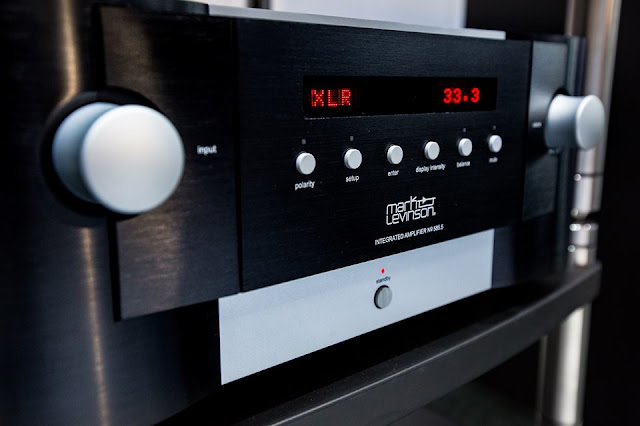 The Mark Levinson Nº 585 has swept up best in class awards and countless accolades around the world, and is now widely regarded as perhaps the finest integrated amplifier ever made. Now, the Nº 585.5 redefines the playback quality of a classic medium; by adding the same Pure Phono stage found in the award winning Nº 523 and Nº 526 preamplifiers taking the reproduction of any source material to new heights of realism. The foundation of the No 585.5 is its fully discrete, mirror-imaged, dual-monaural analog circuitry featuring individual signal switching relays for each of its five stereo inputs: one XLR and three RCA plus a Stereo Pure Phono stage. Volume controls use discrete R2R ladders and low-noise analog switches for the widest possible bandwidth and maximum signal integrity. The fully-differential Class AB power stage includes an oversized 900VA toroidal transformer with individual secondary windings for the left and right channels. Each elegantly simple amplifier channel utilizes twelve output transistors and multiple smaller local capacitors that allow them to be placed physically closer to the amplifiers for greater transient response when power is needed immediately. This robust architecture results in a conservative power rating of 200W per channel. System integration and expansion are possible using the stereo RCA pre-outs which can operate full-range or with an included switchable, second-order, 80Hz crossover filter allowing for seamless integration into 2.1-channel systems with powered subwoofers. 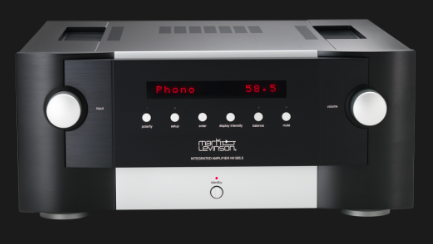 The Pure Phono stage is a discrete design with no op-amps and operates exclusively in class A throughout, employing tantalum nitride thin-film resistors and polypropylene capacitors with exceptionally low tolerances. A fixed-gain moving magnet (MM) section with five capacitive cartridge-loading settings, and a moving coil (MC) section with three gain settings and 10 resistive cartridge-loading settings ensures optimization for any cartridge. And an ultrasonic filter intelligently compensates for rumble and warping. The Pure Phono stage also contains physically separated channels and balanced inputs for sonic purity. Building upon this superb analog platform, the Nº 585.5 adds equally outstanding digital audio capability. An ESS Sabre 32-bit O/A convertor with proprietary jitter elimination circuitry and fully balanced, discrete IN circuitry forms the heart of the digital audio processing stage. 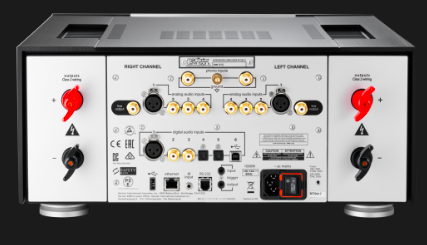 Six digital audio inputs are provided including one AES/EBU, two coaxial and two optical plus a USB audio processor capable of asynchronous data transfer of high resolution DSD and PCM files at up to 192kHz/32 bits resolution. For low-resolution audio formats, proprietary Clari-Fi'" signal processing reconstructs information and bandwidth lost in compressed file formats restoring them to higher fidelity. System integration and communication ports include Ethernet, USB, RS-232, IR input, and 12V trigger input and output. 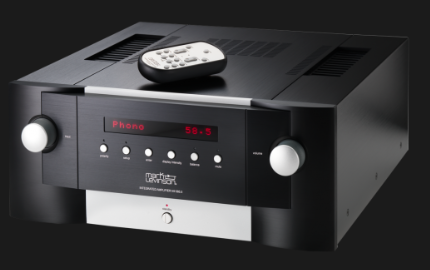 An iconic Mark Levinson custom cast aluminum system IR remote is included with the Nº 585.5. 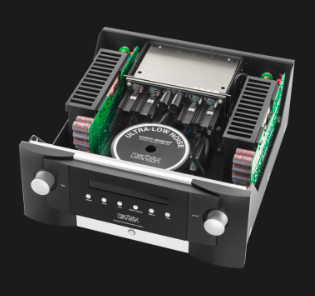 The chassis of the Nº 585.5 utilizes card-cage architecture to isolate critical low-level analog and digital circuitry from the power supplies and amplifier modules. The steel and aluminum construction features internal amplifier heatsinks and Mark Levinson's iconic black and silver anodized aluminum front panel with its intuitive twin-knob control system and unique red display. A newly designed 3-piece anodized brushed aluminum top cover exudes durability, elegance and quality.